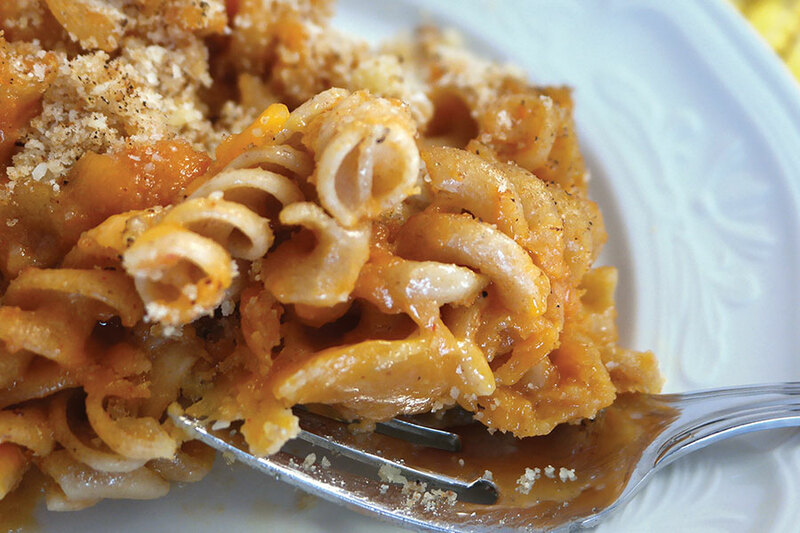 Sweet Potato Mac & Cheese Recipe | Winners Drink Milk! Mash sweet potatoes and set aside. Add sweet potatoes to cooked pasta in saucepan; stir in nutmeg, cayenne pepper, and season with black pepper. Add cheddar cheese, and 2 tbsp parmesan cheese. Coat a 9”x 9” casserole with cooking spray and pour in noodle mixture. In small bowl, combine breadcrumbs, remaining parmesan, and oil; sprinkle evenly over noodles. Cover with foil, and bake for 20 minutes. Remove foil, and continue baking for an additional 20–40 minutes, until lightly browned and crisp on top. Pumpkin can be substituted for sweet potatoes. Using sweet potato adds flavor and Vitamin A. Add 4 oz cooked chicken and dinner is complete! Visit acfchefs.org for more kid friendly recipes!